TOR BRITE, TiO2 synergist, offers exceptional brightness / whiteness in applications including Paints & Coatings, Plastics, Solid Surface, Engineered Stone and Gel Coats. 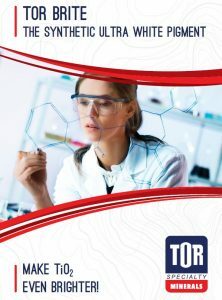 Up to 35% substitution of white TiO2 in formulation can improve whiteness due to TOR BRITE’s inherent low b value. TOR BRITE is available in 2 particle sizes- standard and F (fine), for thin film / coating applications.